THIS IS THE DOSSIER THAT EVERYONE IS TALkING ABOUT! The controversial 2016 election of Donald Trump as the 45th president of the United States sparked a debate that promises to define the global political dialogue going forward. Behind the scenes, however, a deeper dynamic has been put into play: conspiracy theory has moved from the sideline fringe onto America’s central stage. This book examines The Donalds’s history of creating alternative realities with “alternative facts” and “fake news” and the authentic conspiratorial points of view from which they arise. TRUMPOCALYPSE NOW! takes a look at Trump’s career as a conspiracy theory celebrity, his trafficking in such notions as birtherism, Islamofascism and 9/11, the conspiracies of the Clinton era, and the JFK assassination. It also examines the controversies of the 2016 election, including the cyberhacking of the DNC, the Russian involvement and voter fraud. Learn the parapolitical realities behind the partisan divide and the real ideological underpinnings behind the country’s most controversial president. Chapters include: Introduction: Alternative Facts; Conspiracy Celebrity–Trump’s TV Career; Birtherism; 9/11 and Islamofascism; Clinton Conspiracies; JFK–Pro-Castro Fakery; Cyber Hacking the DNC; The Russian Connection; Assassinologist; End Times; The “Golden Showers” Dossier; more. Read the entire British Intelligence report on how Trump is being blackmailed by the Russians for his sexual escapades in Moscow. The Dossier discussed in the news everyday! What does it have to say? Read it here! Specially discounted! TRUMPOCALYPSE NOW! 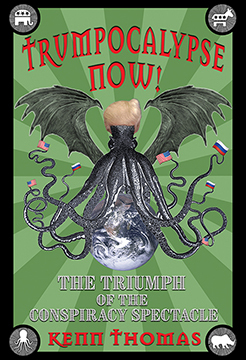 The Triumph of the Conspiracy Spectacle by Kenn Thomas. 6x9 Paperback. 194 Pages. Illustrated. References.